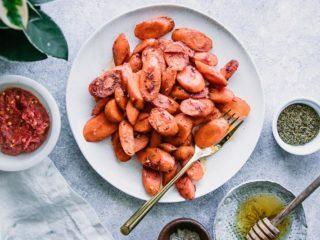 Honey Harissa Roasted Carrots, a simple roasted carrots side dish recipe with a sweet and spicy honey harissa sauce. Only five ingredients and fifteen minutes! Heat olive oil in a large cast iron skillet over medium-high heat. When warm, add carrots and pan roast 7-10 minutes until golden brown, stirring frequently to brown all sides. Meanwhile, add harissa sauce, honey, and water to a small mixing bowl and whisk until well combined. When carrots are softened and browned, pour sauce into pan with carrots and mix until vegetables are coated evenly. To serve, remove carrots to a plate and top with cumin seed and a sprinkle of flaked sea salt. Enjoy! Notes: this recipe can also be done in the oven by preheating to 400 F and roasting carrots until golden brown, then adding sauce to coat and cooking a few minutes more.